I am in that lull between real Christmas and my Christmas as all my descendants are on their way to visit. Still trying to work out how to fit seven people into one large bedroom and two tiny bedrooms (one of which has no bed in). I think I will be evicted to either the conservatory (a little bracing at this time of year) or the living room. The downside of the latter is that I will have to go to bed last, not something that I normally do even when in good health and inevitably, as it is Christmas, I am not. Having had a vague sort of sore throat for about a week, on Christmas night it developed into a full blow agonising sore throat/ear ache/swollen glands but weirdly on one side only. I made the mistake of looking it up on the internet – well you do don’t you? One of the options was ‘potentially fatal’ so then came the task of accessing a doctor on Boxing Day. Having no voice that could comfortably be used I assigned the task of ringing 111 (for the benefit of overseas readers, in the UK, this is for non-life threatening problems) to my partner in crime. I needn’t have worried about having no voice, after half an hour of ‘we are experiencing heavy demand’ there was still no one to talk to, so we gave up and headed to the local minor injuries unit. Two hours and three health professionals later I was told it was ‘probably viral’ and rest and fluids were prescribed. I was hoping for something a bit more conclusive like ‘this definitely isn’t the thing with the long name that leads to your throat closing up and you being unable to breathe.’ Heigh ho. I ask if it is still sensible for two small children to be in the vicinity of my germs, it seems it is fine. I promise not to lick their faces. I am blaming ill health for one of my senior moments before Christmas. We were trying to exit the local multi-story car park, not something we do very often. ‘Insert your ticket here’ it says, so I do … several times. It keeps asking me to insert my ticket. I let a couple of other people try – they have no problem. I then realise that I am inserting, not my parking ticket, but a business card that I have just been given by a travel agent. Yes, travel agent – our trip to Canada for 2015 is now official. We will be combining a DIY tour with a package, seriously spending the descendants’ inheritance here. Trying to organise the camper van has not been without incident. I have spent a long time engaged in online ‘chat’ with ‘Vlad’ from the hire firm, whose avatar bizarrely is that of a young female. Peculiarly, it is cheaper to hire a five berth van than it is a two berth. When I asked Vlad why, he replied that it was demand. I decided I wouldn’t ask why they didn’t just buy more smaller vans!! Then there was the incident with the washing machine. There it was spinning merrily when suddenly all its lights were flashing and it ground to a halt. I turned it off and on again as recommended. I was just wondering if I should be ignoring the smell of burning rubber when it stopped again. Unusually, I was able to open the door to let the washing out, inevitably this also let out gallons of water in an uncontrollable whoosh. Typical, just as I am about to have all the post visitor bedding to cope with. I am reassured because it is under guarantee – regular readers may remember the washing machine saga from earlier in the year. This turns out not to be much of a bonus as the call out fee is £110 and if I turn out to have committed the sin of neglecting to un-block the filter then I am in deep trouble. Errr unblocked the filter mmm (searches frantically for manual). 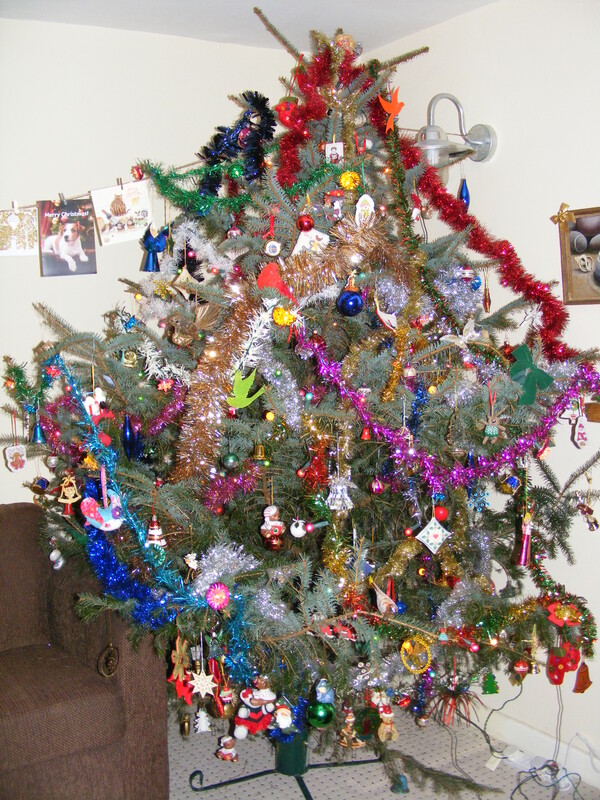 My poor Christmas tree has not held it’s needles well, to be honest it hasn’t held its needles at all. Every time someone breathes a deluge of needles patter on the presents below and if you inadvertently sneeze there is a positive tsunami. Nonetheless I am sure Santa won’t mind and we will have a wonderful second Christmas Day. As part of my 1946-1969 project my lovely volunteers are currently writing about their memories of Christmas. Just to prove that I don’t ask them to do anything that I wouldn’t do myself here are my efforts. I have left out the section on tree decorations as I covered that last year. Preserving your recollections of the holiday seasons of the past are part of your family history and what better time of year to start jotting down your own family’s traditions. The Christmases of my childhood were magical times, although I am sure they were stressful for my mum who, when I was small, normally catered for the extended family at some point during the festive season. The build up to Christmas was accompanied by the opening of the cardboard doors of an advent calendar. These were the sort with pictures behind; it was long before chocolate advent calendars. I would get a new one most years but still kept and opened the old ones. I remember one year we had one with a window for the 26th on – very strange. When I was first married it was a Snoopy advent calendar each year. For Rebecca’s second Christmas she had the cardboard calendars but also a ‘chimney’ with small boxes that could be filled with gifts. When Martha arrived we acquired a set of advent boxes in the shape of houses, so that we had a second way of dispensing advent gifts. It was quite difficult to find things to fit in these containers so mum made a series of bags from wrapping paper, which were slightly larger and the girls swapped between one or other of these calendars until they were adults. At middle school both Martha and Rebecca won several prizes for increasingly impressive home made advent calendars. Decorating the house was hugely important and still is. Most of the decorations are old friends and bring back many memories. One year, when we lived at Firsby Avenue, mum made amazing door decorations from coloured shiny paper, that was the latest trend that year. There was an angel, a tree and a stocking amongst the collection. A less successful attempt at home made decorations came from another new invention. Some kind of granules were purchased that could be turned into minute polystyrene balls, perhaps by boiling, I can’t remember the process. These were dyed and glued to twigs from the garden. It was the gluing part that was tricky and polystyrene balls adorned the hall floor all that Christmas season. We had a nativity set that my father had painted. Strangely this had four kings, later I was knowledgeable enough to know that this was not biblically inconsistent – three gifts but no record of the number of donors. I still have ‘angel chimes’ which revolve and make an irritating noise when the candles under them are lit and the heat causes them to move. I also have a cardboard boot, which started life as a container for a present but which still comes out each year as a decoration. These made the Christmases of my childhood a wonderful place. I would hate a colour co-ordinated scheme that had no sentimental associations. Decorations that date from the 1980s included a door mat that, by means of a battery, went ‘Ho, ho, ho, Merry Christmas’ when someone trod on it. The novelty of this soon paled and it used to spend most of the season with its battery detached. On one occasion I was up the other end of the hall and sneezed, always a violent activity. The vibrations set the mat off, something I have never been allowed to forget. Family traditions were established over the years. Mum made me an enormous netted stocking for my first Christmas that was decorated with ribbon bows. Rebecca later took this over and I made an identically sized one for Martha. There was also a special Christmas ribbon that had to ornament my ‘best’ present. Stocking presents were opened in bed at a very early hour. I knew that childhood Christmases were over when, aged thirteen, I didn’t wake up in the early hours of Christmas morning. Main presents were opened after breakfast and might take most of the morning. They were unwrapped slowly and in turn so we could see what each other had received. We had to use particular pairs of scissors that I think had come from my great-grandmother Clara Woolgar née Dawson. The shape was identical but mum had the larger ‘mummy’ pair and I had the smaller. The paper was always smoothed out and saved for another year, cutting off any sellotape round the edges so the papers got smaller and smaller each year. I still find it really difficult not to do this, even though I have enough paper to last for the rest of my life. As soon as my dad died, at the age of nine, I took Christmas present buying for mum very seriously. I saved six pences in a little boot shaped purse all year and used other pocket money to buy her a range of presents, relying heavily on Woolworths and Boots as sources of these. She didn’t have a stocking but her small under-the-tree presents usually included a reel of cotton and matching bias binding and a walnut whip. I continued this tradition well into adulthood as a joke. One year I purchased a packet of ten cigarettes, which I appear, as a twelve year old, to have been able to do without question and wrapped them individually. I am not sure if they were smokable afterwards! Records survive of some of my purchases. In 1969, amongst other things, I spent 4/11 on a glass animal from Kennards Arcade, 2/4 on hand cream from Woolworths and 11d on a flannel from Boots. Christmas was never about the food. I do remember how difficult family Christmas cooking was for mum, who was never any more fond of cooking than I am. In the years before my day died when we entertained my paternal grandparents, two uncles and aunt, as well as my mum’s Uncle Percy, there was one year when the roast potatoes found themselves on the floor. I don’t think the three second rule had been heard of then but the potatoes were eaten, we survived and none the wiser. Then there was catering for Uncle Percy, who emphatically didn’t eat turkey – except of course when we convinced him that it was chicken! When I was married I started making Christmas cakes and puddings each year, both of which I love. I usually produced several of each. The ritual was important and once the girls were old enough, they joined in, taking it in turns to add ingredients. It was always difficult to fit everything in the mixer bowl and someone had to hold a spatula in place at the top of the bowl as the mixer revolved in order to stop everything coming out. More recently I have abandoned the mixer bowl altogether. We have always used the large mixing bowl that mum had as a wedding present to mix the dry ingredients by hand. Cake and pudding making has not been without incident. One year I put silver coins in. No one had warned me that this was not especially hygienic or that they should be inserted after cooking not before. I did forget a vital ingredient one year and on another occasion we used whole almonds because they were cheaper than the ground sort. We tried, unsuccessfully, to chop these up and then attempted to liquidise them. Putting them in whole was not an option as I don’t actually like nuts! The icing has caused problems over the years. I am particularly inept at this so the usually opt for a ‘rough snow’ style. I use royal icing that I mix myself and I don’t always get the consistency right. I did end up with a donut-like ring of icing on the plate round a icingless cake one year when it was too runny to stay on the cake at all. I also remember putting it outside on the door step at Cross Street, where it was cold, to try and get the icing to set. That may have been the year that I didn’t actually ice the cake until Boxing Day. ‘Entertainment’ came in the form of quizzes and games. I can remember one year recording the relatives on my reel to reel tape recorder then playing the voices back at the wrong speed to see if we could guess who was who. We played many board games; there was traditionally a new one each year. We didn’t particularly watch anything on television at Christmas, although we always watched ‘The White Heather Club’ on New Year’s Eve. There would be the usual round of Christmas specials from the likes of Morecombe and Wise and the Two Ronnies. Purchasing the Christmas Radio and TV Times (one giving BBC programmes and the other was for ITV) was essential; these were often fortnightly, instead of weekly, issues. Harry Bellefonte’s ‘Mary’s Boy Child’ was the first Christmas record that I remember. As a teenager we listened to Phil Spector’s Christmas album each year. When my Children were small favourites were the Spinners’ ‘Mrs Hooligan’s Christmas Cake’ and ‘Donald where’s your Trousers’. We always went to the pantomime shorly after Christmas at the Ashcroft Theatre in Croydon. These normally starred Cyril Fletcher and Dame Peggy Ashcroft and included a Harlequinade, which was superfluous to the plot. We usually had good seats at the front on the left as you faced the stage. I have no idea how early mum had to book, or how much she had to pay, to get these premium seats. Being at the front was very important as at some point children would be invited to go up on stage and it was whoever could get there quickest. I don’t remember being disappointed. The lucky children would then help with the audience participation song and I think, were given a small gift. Christmas is and always has been very special to me. When things are quiet on the blog front you can be sure that they are busy in life. I am currently catching up whilst waiting for a delivery. Said delivery will allegedly occur between 7am and 1pm, hence the need to not only be awake by 7am – never difficult – but also to be dressed and respectable – more tricky. Now that I have made the effort they will probably arrive at 1pm, if at all. So what have I been up to? I have just completed a 4000 word article about Bible Christians in North Devon. A bit of a pity that a) it started out being 5000 words long and b) that I read the eight page style guide after I had completed it. I have also compiled another chapter for my 1946-1969 book – on housework this time. Amongst several recent talks, I extolled the virtues of One-Place Studies at the Society of Genealogists. Co-incidentally, amongst the enthusiastic audience was a lady whose ‘place’ was where I grew up and we have since exchanged information. Another co-incidence occurred when I was tracing the family history of a new member of our local history society. Imagine my surprise when I discovered that his ancestors were not long term Devonians but were distantly related to my daughters’ Wiltshire forebears. I had a great time in Bude as usual, talking about witchcraft this time, my online early twentieth century community history course has come to an end and I have just hosted a Hangout-on-Air for the Society for One-Place Studies. Just a couple more engagements this year, including a return visit to Buckinghamshire Family History Society. Things don’t look like being any less hectic next year as I already have a very full calendar including Who Do You Think You Are? Live in Birmingham, the Guild of One-Name Studies annual conference, a Baltic cruise for an Unlock the Past Cruise and two remote presentations for the Ontario Genealogical Society Conference in May – so much for things calming down! I have spent a couple of days with seven year olds at the time of the Great Fire of London. My colleague asked if any of the children knew the name of the biggest church in London. One of the adults in the party attempted to whisper ‘St. Paul’s’ to the child next to her. Confidently the child put up his hand. His response – ‘Santa Claus’ – Chinese whispers rules. 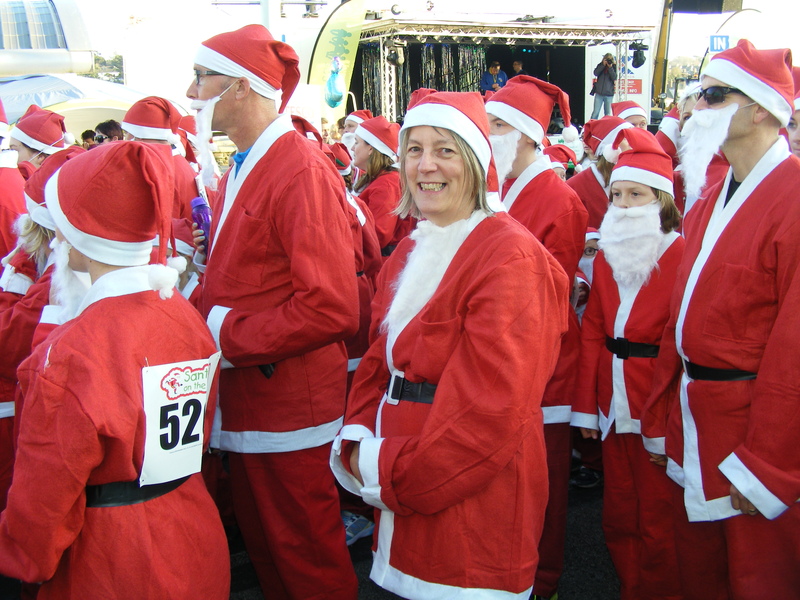 On the subject of Santa Claus, I completed my Santa ‘fun run’ at the weekend. Not only was it probably the warmest November day on record but someone had decided that making the Santa suits of felt was a good idea – just a tad cosy. I am very grateful to all those who sponsored me in aid of Children’s Hospice South West; still time for additional sponsors. The round of Christmas get-togethers has begun with the Braund Society lunch at the weekend. Probably a good job I have been fun-running in preparation for the surfeit of food.